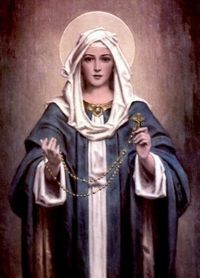 Our Lady pleaded and insisted than men must say the Rosary daily. The Rosary is like a weapon Mary can use to cut down heresy and forces of evil. It is very powerful and many times the world was saved from very bad situations. Pope Pius IX said, "Give me an army saying the Rosary and I will conquer the world." "If you want peace in your heart, in your home, in your country, assemble together every night and say the Rosary," said St. Pope Pius X. "For never will anyone who says his Rosary every day become a formal heretic or be led astray by the devil," said St. Dominic de Montfort. "Nobody who perseveres in saying the Rosary will be damned, becaused they obtain for their servants the grace of true contrition for their sins and by means of this they obtain God's forgivness and mercy," said Our Lady. Which group of Mysteries do you say each day?